Hailing from Albany, GA, Untamed is a multi-genre fiction author who accredits her early education in magnet school programs for her creative mind and passion for the literary field. She is a graduate of the University of Maryland University College, and is an honored member of Sigma Alpha Pi. She first found a love of writing as a young child through her love of reading. It was the novel entitled, Coming of Age by Lorri Hewitt that truly inspired Untamed and became the flame that ignited her introduction to the pen and pad. Untamed's writing journey began at thirteen years old with poetry, spoken word and short stories. Throughout her high school and college years, she received many accolades for her writing ability to include the Coca-Cola Young Writers Award and honorable mention in the Sandhills Writers’ Conference. Deciding to pursue a career in business, Untamed set aside writing for years. However, after suffering the loss of her child, she felt a void in her life and began writing again to remain encouraged. Yet, the void still seemed to remain and she began to develop her writing talents as a novelist due to her own personal life experiences. It was then that Untamed realized her gift should be shared with the world and she made the decision to become a published author. Best known for her gritty yet flavorful language, Untamed embraced urban literature to bring about knowledge and support through real life, every day stories with highly animated and lifelike characters. Her powerful words and straight up, no-chaser verbiage delivers punches that will leave you screaming for more. In 2012, Untamed released her debut novel entitled, Never Again…No More through One Karma Publishing to rave reviews. 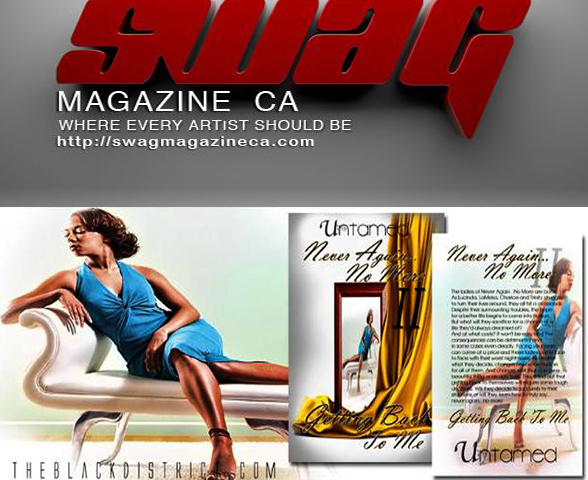 Untamed’s work has been featured in several print ads including SWAG Magazine CA and Kontrol Magazine. Untamed has also had several author features and interviews including noteworthy interviews with NTUNED Radio Show, the Poetic Soul Talk Show and PD Radio which generates thousands of listeners. Since that time, Untamed has become a self-published author and penned seven novels to date. Her second novel entitled, Never Again…No More II: Getting Back to Me broke into the Amazon Top 100 for Literature- Fiction becoming an official Amazon Bestseller in July 2013. 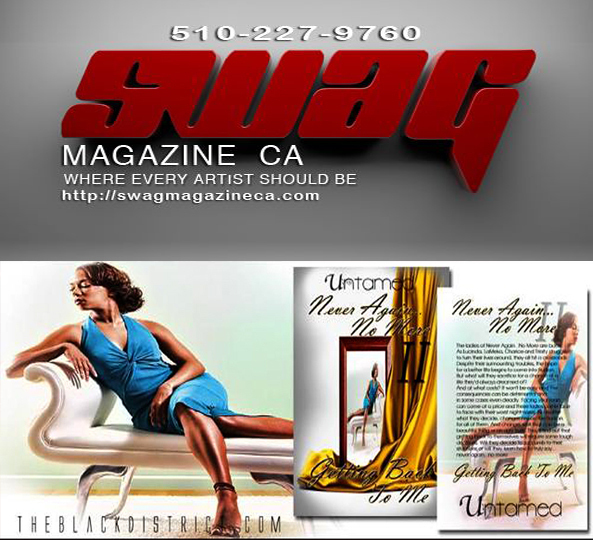 Her diligent work led to a budding opportunity as a writer and interviewer with SWAG Magazine CA and SWAG Magazine Souf based out of the Bay Area in California. Her interviewees and write-ups include Hollywood Pompeii, DJ N-Fluence (a budding DJ from Australia) and Hazel E from VH1's Love & Hip Hop Hollywood just to name a few. She is also a dedicated volunteer for Mothers Against Drunk Driving. As a volunteer and committee member for Augusta M.A.D.D., she is committed to honoring the memory of her family members who passed away in a drunk driving crash by creating a legacy of giving to support other victims and survivors. In March 2015, she released a poetry book that is near and dear to her heart entitled, This Side of Heaven-A Poetic Journey of Strength and Survival which rose to the charts of Amazon as the #1 Hot New Release and an Amazon Bestseller. It is a collection of poems dedicated to her daughter, mother and cousin for which all proceeds are donated to M.A.D.D. (Mothers Against Drunk Driving). Writing is truly a passion for Untamed and it is her hope that her writing will fulfill her purpose to touch lives, encourage growth and give a voice to the voiceless. Staying true to this goal, Untamed will continue to share her gift of writing for years to come as she delivers it to you real, raw and purely Untamed! She currently resides in Georgia with her husband and children.